In the conservative treatment of postdiaphragmatic hernia chylothorax, use of octreotide (OCT) had variable results. Limited chyle drainage has not been tried. 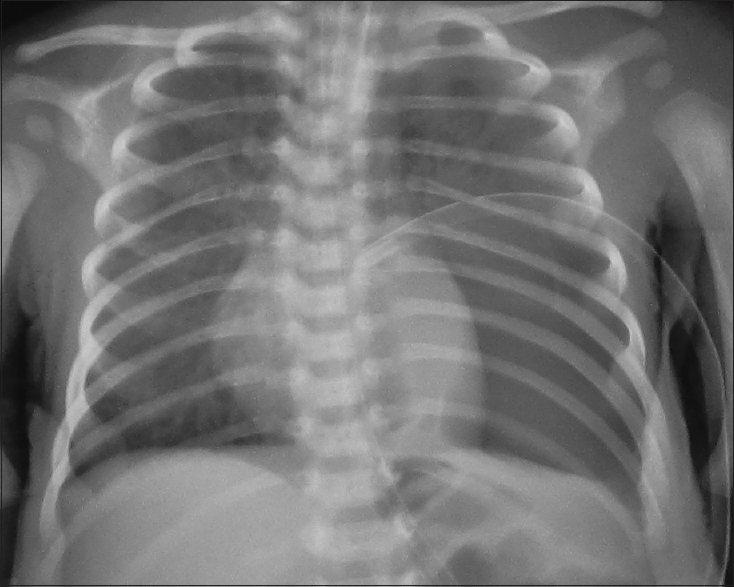 A newborn, after the left Bochdalek diaphragmatic hernia repair, developed chylothorax. Treatment with intercostal chest tube (ICT) drainage, partial parenteral nutrition (PPN), and medium-chain triglyceride (MCT) with formula feeds was ineffective. ICT slipped out on the 13th day in the presence of significant residual chylothorax. Further drainage was not done. Addition of OCT infusion at maximum dose of 6 μg/kg/h cleared the chylothorax. No side effect of OCT was observed. The present case has proved that MCT feeding along with PPN is effective, and limited drainage of chyle is enough with OCT treatment in postdiaphragmatic hernia chylothorax. Chylothorax following congenital diaphragmatic hernia (CDH) repair occurs in 4.6%–28% cases., Chylothorax is diagnosed if the pleural fluid triglyceride concentration is >1.1 mmol/L and cell count >1000/mm3 (with lymphocytes >80%). The morbidity and mortality normally associated with CDH are aggravated by chylothorax. Conservative treatment of chylothorax includes total parenteral nutrition (TPN), nil per oral (NPO), and intercostal chest tube (ICT) drainage. Use of octreotide (OCT) in the conservative treatment had varying results., Limited chyle drainage has not been tried. A case of post-CDH chylothorax successfully treated by limited ICT drainage and OCT is reported. 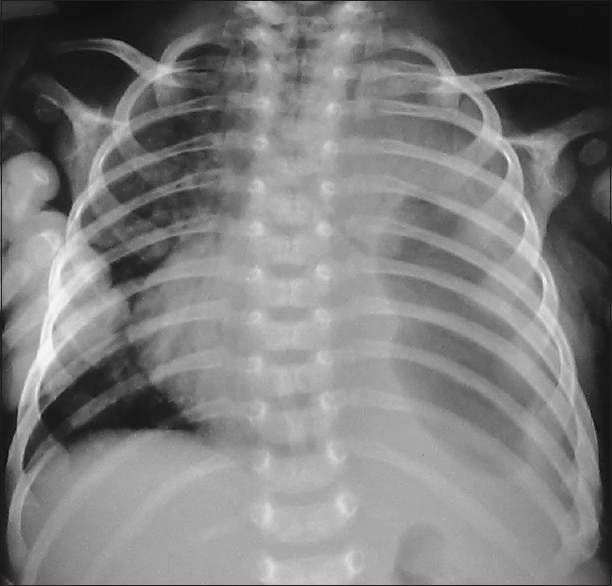 A male baby, delivered at 38 weeks with birth weight 3150 g, had respiratory distress and cyanosis at birth due to left congenital diaphragmatic hernia. He was given high-frequency ventilation followed by conventional ventilation. He underwent laparotomy after 48 h preparation. Small bowel, large bowel, stomach, and spleen occupied the left hemithorax. The left lung was extremely hypoplastic. Posterior rim of diaphragmatic defect was absent. Transversus abdominis muscular flap fashioned from the left lateral wall was used to close the diaphragmatic defect. Postoperative ventilation was continued for 4 days. Orogastric tube feeding was started 72 h postoperative and gradually increased. On the 11th postoperation day, he developed respiratory distress, with radiographic evidence of the left-sided pleural effusion [Figure 1]. Mechanical ventilation was restarted and ICT was inserted. It drained 130-ml brownish fluid immediately, followed by 100 ml/day. Pleural fluid triglyceride (0.7 mmol/l) and protein levels (24.4 g/l) were not suggestive of chylothorax, but its leukocyte count was 11.384 × 103/ml (98.6% lymphocytes). After 4 days of ICT drainage, seeing near-total clearing of effusion [Figure 2], ICT was removed. He was freed from ventilator on the 18th postoperation day, continued with high-flow nasal oxygen and full oral feeds (about 25 ml hourly). He gained weight. On the 25th postoperation day, radiograph showed marked left pleural effusion. On the 29th day, ultrasonogram of the chest showed about 150-ml fluid and collapse of the left lung. On the 30th day, ICT was reinserted. The fluid was cloudy, light yellow with triglyceride (3.39 mmol/l), protein (26.6 g/l), and leukocyte count (3.339 × 103/ml with 99.1% lymphocytes) diagnostic of chylothorax. Blood chemistry showed conjugated hyperbilirubinemia. Medium-chain triglyceride (MCT) oil (5 ml 4 hourly), mixed with formula milk (10 ml 2 hourly) oral feeding and partial parenteral nutrition (PPN), consisting of 10% dextrose and amino acids through peripheral vein, albumin and immunoglobulin infusions were given. Drainage through ICT dropped to 3 ml/day and the tube slipped out on the 43rd day. Next morning, the child was tachypneic and skiagram showed significant chylothorax [Figure 3]. Oral feeding was further reduced. On the 46th postoperation day, OCT was added to control chylothorax. OCT was given as continuous infusion, starting with a dose of 1 μg/kg/h, adding 1 μg/kg/h on alternate days to reach 6 μg/kg/h (422 μg/24 h) on day 10. Chest radiograph showed marked reduction of chylothorax and partial expansion of the lung. Serum biochemistry showed less cholestasis. Then, milk + MCT feeding was increased. On the 18th day of OCT, there was very little residual chylothorax, with better expansion of the lung [Figure 4]. PPN was discontinued and full oral feeding was started (35 ml 2 hourly). The child weighed 2920 g. Tapering of OCT dose began on the 66th postoperation day through 300 μg/24 h, 200, 125, and finally stopped by the 76th day. Each down-dosing was done after 2 days intervals. There was no complication of OCT. At 80-day age, the child was discharged home with body weight of 2974 g.
Patch repair, extracorporeal membrane oxygenation,, and prenatal diagnosis of CDH are risk factors to develop chylothorax in CDH. There are several theories of causation of chylothorax in CDH. The most widely accepted is rupture of lymphatic vessels during CDH surgery. Pressure exerted by the herniated organs causing damage to lymphatic vessels and malformation of lymphatic vessels associated with malformation of diaphragm are other causes. Respiratory dysfunction, cachexia from protein and lipid loss, dehydration, electrolyte imbalance, immunodeficiency due to loss of immunoglobulin and lymphocytes with resultant nosocomial infections, coagulopathy, and increased mortality are consequences of chylothorax. Most chylothoraces (83.1%) were successfully treated without surgery., MCT oil-rich diet can be used because it enters directly into the portal circulation and thus decreases lymphatic flow. In our case of chylothorax, conservative treatment using MCT with milk, PPN, and ICT drainage was given. Total parenteral nutrition (TPN) was avoided due to the presence of conjugated hyperbilirubinemia and to avoid central venous access with its complications including sepsis. The apparent arrest of ICT drainage was probably due to blocked tube and not from arrest of chyle secretion, as evidenced by significant effusion radiologically, when ICT expelled. We avoided further drainage because there was no respiratory distress; also to avoid nutritional, immunological, and septic complications from loss of chyle. At the same time, the prevention of chyle reaccumulation was intensified by adding OCT. Saeidi et al. recently treated chylothorax due to the congenital heart disease in neonate without ICT (with pleural tapping), TPN, nil per oral (NPO) followed by diet rich in MCT and OCT.
OCT, a synthetic somatostatin analog, acts by decreasing splanchnic blood flow and inhibits release of serotonin, gastrin, vasoactive intestinal peptide, secretin, motilin, and pancreatic polypeptide. There are occasional reports of use of OCT in resistant cases of post-CDH chylothorax.,,, Landis et al. reported previous 11 cases and their own 11 cases. Out of the previous 11 cases, four had resolution of the effusion after OCT treatment and seven failed. Landis studied their 11 cases. Five infants were managed conservatively with thoracostomy and TPN, six received OCT also. Jarir reported two cases of successful treatment with OCT. Most of the published studies have used OCT dose of 3.5–12 mcg/kg/h as continuous IV infusion and the total duration of therapy was 5–25 days. There was no complication, except one case died due to sepsis. In our case, the maximum dose required was 6 μg/kg/h and the duration was 30 days. Recently, Saito et al. reported use of high-dose (20 μg/kg/h) OCT to treat three cases of neonatal chylothorax including one post-CDH chylothorax. The present case proved that MCT feeding along with PPN is effective, and complete drainage of chyle can be avoided with OCT treatment. Positive attributes of OCT treatment are shortening the treatment period in neonatal intensive care unit, avoidance of repeated thoracentesis or ICT drainage, allowing oral feeding, fewer fluid and plasma transfusions, low risk of infection, and low cost of therapy. Resistant chylothorax can be successfully treated by MCT-enriched feeds, PPN through peripheral vein, limited drainage of chyle, and OCT infusion. Such method avoids the complications inherent to central vein cannulation, TPN, and loss of chyle. The authors gratefully acknowledge the motivation and cooperation given by Dr. Ghazi Mukattash, Consultant and Chief of Department of Pediatric Surgery, MCH, Najran, as well as Dr. Ahmed Haj Abdo, consultant and the then Chief of Department of Neonatology, MCH, Najran, in the management of this case and in the preparation of this manuscript. Zavala A, Campos JM, Riutort C, Skorin I, Godoy L, Faunes M, et al. 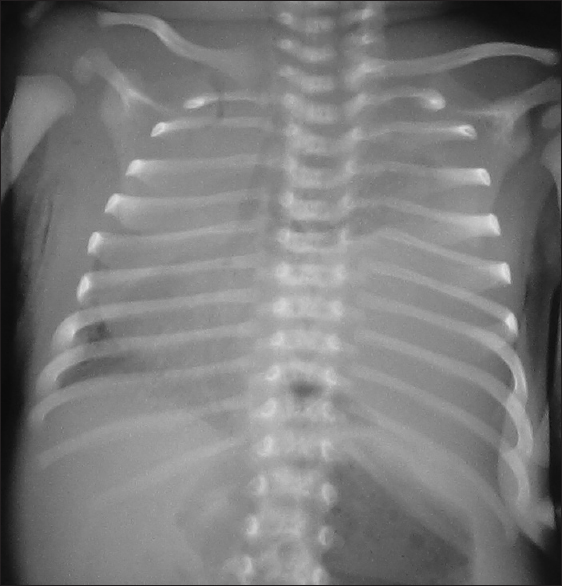 Chylothorax in congenital diaphragmatic hernia. Pediatr Surg Int 2010;26:919-22. Levy SM, Lally PA, Lally KP, Tsao K; Congenital Diaphragmatic Hernia Study Group. The impact of chylothorax on neonates with repaired congenital diaphragmatic hernia. J Pediatr Surg 2013;48:724-9. Goyal A, Smith NP, Jesudason EC, Kerr S, Losty PD. Octreotide for treatment of chylothorax after repair of congenital diaphragmatic hernia. J Pediatr Surg 2003;38:E19-20. Landis MW, Butler D, Lim FY, Keswani S, Frischer J, Haberman B, et al. Octreotide for chylous effusions in congenital diaphragmatic hernia. J Pediatr Surg 2013;48:2226-9. Gonzalez R, Bryner BS, Teitelbaum DH, Hirschl RB, Drongowski RA, Mychaliska GB, et al. Chylothorax after congenital diaphragmatic hernia repair. J Pediatr Surg 2009;44:1181-5. Okada T, Honda S, Miyagi H, Minato M, Taketomi A. Chylothorax after repair of congenital diaphragmatic hernia in a neonate: Usefulness of conservative management. Surg Sci 2012;3:93-5. Saeidi R, Nourizadeh S. Octreotide for the management of chylothorax in newborns, Case Report. Imp Jpn Navy 2014;5:37-9. Available from: http://www.rxlist.com/sandostatin-drug. [Last reviewed on 2017 Jan 26]. Jarir RA, Rahman SU, Bassiouny IE. 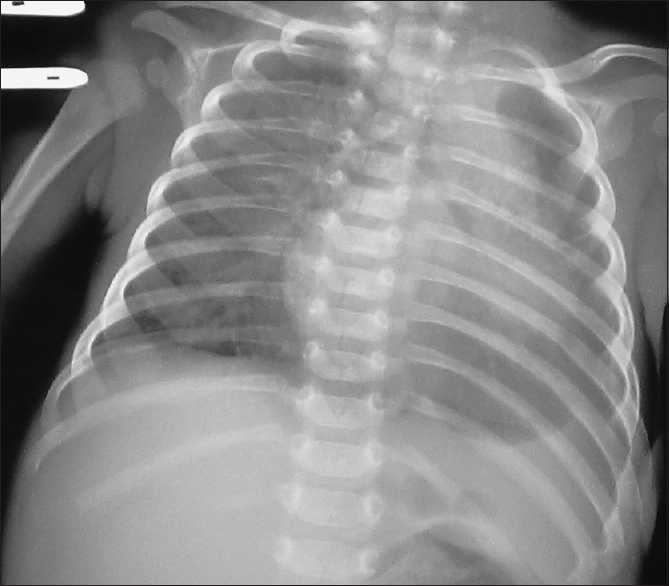 Use of octeriotide in the management of 6neonatal chylothorax secondary to repair of congenital diaphragmatic hernia: A report of two cases and review of literature. J Clin Neonatol 2012;1:91-5. Saito M, Kamoda T, Kajikawa D, Miyazono Y, Kanai Y, Fujiyama S, et al. High dose octreotide for the treatment of chylothorax in three neonates. J Neonatal Biol 2016;5:218. Roehr CC, Jung A, Proquitté H, Blankenstein O, Hammer H, Lakhoo K, et al. Somatostatin or octreotide as treatment options for chylothorax in young children: A systematic review. Intensive Care Med 2006;32:650-7.